Our wooden knobs add an elegant touch to any drawer or cabinet. 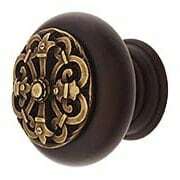 Made from real wood and brass, these beautifully designed wood knobs are available in a wide variety of sizes, styles and finishes. 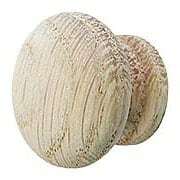 We also offer unfinished solid oak wood cabinet knobs that are ready to paint or stain. This handsome hardwood knob adds a new level of distinction to your cabinets and furniture. 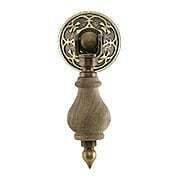 Offered in solid walnut or cherry, it features a pewter onlay with a regal crest design. 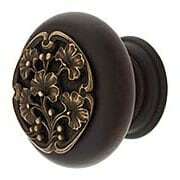 Precision cast for exceptional detail, then hand finished in antique pewter or antique brass. Made in the USA. 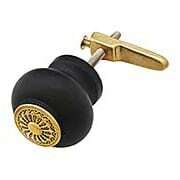 Add a new level of distinction to your cabinets and furniture with this handsome hardwood cabinet knob. 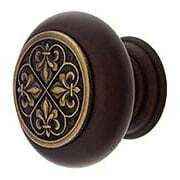 Offered in solid walnut or cherry, it features a pewter onlay with an intricate fleur-de-lis design. Precision cast for exceptional detail, then plated and finished by hand. Made in the USA. 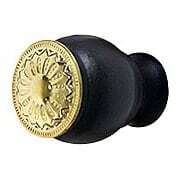 This classic round knob is a Craftsman-era classic. 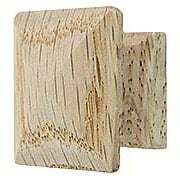 Made of high-quality oak, it's versatile design lends a traditional charm to just about any oak cabinet door, drawer, or Craftsman furniture piece. Left unfinished, it can easily be stained, varnished or painted. 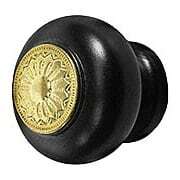 This pyramid style knob is a Craftsman-era classic. Made of high-quality oak, it's timeless design offers a traditional charm to just about any oak cabinet door, drawer, or Craftsman furniture piece. Left unfinished, it can easily be stained, varnished or painted. 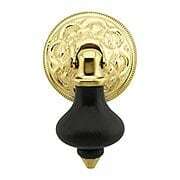 Whether restoring turn-of-the-century (circa 1900) empire-style cabinets and furniture, or for use on more modern pieces, this versatile knob is a fitting choice. 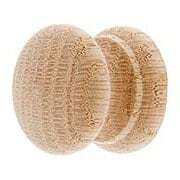 Made of high-quality oak, its unfinished surface can easily be stained, varnished, or painted. 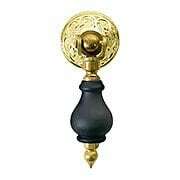 These Victorian tear-drop pulls aren't just for furniture. 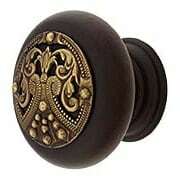 Imagine the elegant impression they'd make on cabinets and drawers throughout your home. 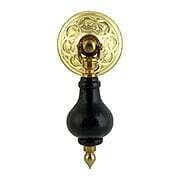 The 1870s design is recreated in solid brass with an ebonized wood pendant. Dangling tear drop pulls were popular throughout the late Victorian era. 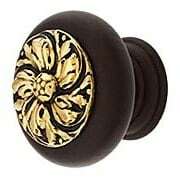 Typically found on Eastlake or Renaissance Revival furniture, they're a dramatic accent for your kitchen or bath as well. 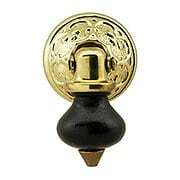 Solid brass with an ebonized wood pendant. Add a new level of distinction to your cabinets and furniture with this handsome hardwood cabinet knob. Offered in solid walnut or cherry, it features a pewter onlay with an intricate French Renaissance design. Precision cast for exceptional detail, then plated and finished by hand. Made in the USA. 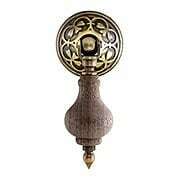 Embossed with a design of swirling ginkgo leaves, this handcrafted pewter and wood knob is a fine example of the English Arts & Crafts style. Inspired by the wallpapers and fabrics of William Morris (circa 1870s), it's a lovely addition to furniture or cabinetry throughout your home. 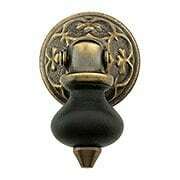 The onlay is precision cast for extra detail, then hand finished in antique pewter or antique brass. Made in the USA. 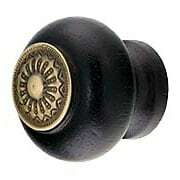 This distinctive hardwood knob adds a whimsical, tropical flair to your cabinets and furniture. Offered in solid walnut or cherry, it features a pewter onlay with a British Colonial theme - an officer astride an elephant in the jungle. 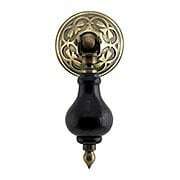 Precision cast for exceptional detail, then hand finished in antique pewter or antique brass. Made in the USA. 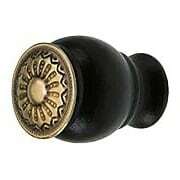 Whether restoring turn-of-the-century (circa 1900) empire-style cabinets and furniture, or for use on more modern pieces, this versatile knob is a fitting choice. 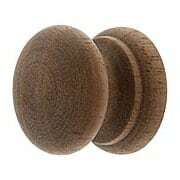 Made of high-quality walnut, it promises long-lasting wear. This handsome hardwood knob adds a new level of distinction to your cabinets and furniture. 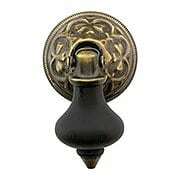 Offered in solid walnut or cherry, it features a pewter onlay with an intricate Celtic design. Precision cast for exceptional detail, then plated and finished by hand. Made in the USA. 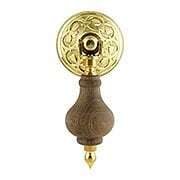 This English Arts & Crafts style knob is a lovely addition to cabinets and furniture throughout your home. Crafted from solid hardwood, it features a metal onlay inspired by the wallpapers and fabrics of William Morris (circa 1870s). Precision cast in pewter then plated and finished by hand. Made in the USA.